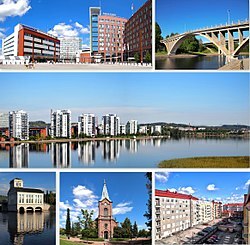 Jyväskylä (Finnish pronunciation: [ˈjyvæsˌkylæ]) is a ceety an municipality in Central Finland in the wastren pairt o the Finnish Lochland. It is the lairgest ceety in Central Finland an on the Finnish Lochland. 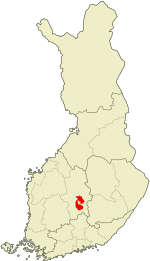 Jyväskylä is locatit on the northren coast o Loch Päijänne, 147 kilometres (91 mi) north-east o Tampere an 270 kilometres (170 mi) north o Helsinki. The hilly an forested terrain in Jyväskylä is surroondit bi hundrits o lochs. Simmers in Jyväskylä are wairm an winters cauld an snawy. ↑ "Twin Cities". City of Jyväskylä. 2012. Retrieved 26 February 2012. ↑ Terhi Saranen (31 August 2005). "Ystävänä kaupunki". Jyväskylä lehti. Retrieved 26 February 2012.